Even if you don't recognize the Darude name, you can't pretend as though you don't know "Sandstorm", the big dance track that put him on the world's radar. That song's infamous for raising the roof, and it has even proven its cultural relevance today by being part of YouTube's April Fools' Celebration in 2015 with the addition of a "Darude - Sandstorm" button on every video that day. But there's a whole album that goes with it — he didn't just make one track and then toss his keyboards out the window and found a hot-dog stand in Ogden, Utah. Nope, he kept on going with his full-length debut album, "Before The Storm". Let's start right off with Sandstorm, that one song. That techy sound is so infectious, I can hear it in my sleep, provided it's the one where I'm out dancing in a Finnish discothèque. This song needs no introduction, as it's basically the one well-known Darude tune out there. While the main synth is the one everyone remembers, I'm actually quite fond of the edgy bassline he uses, too. Sounds like you could slice butter with the sound. Sandstorm is rough, it's pounding, and it's full of the energy you want from a killer dance cut. If you're the one person who hasn't heard it yet (I think it might be someone named Svetlana), then get out there to YouTube and gulp it up. Take a sandstorm to the face! But wait, there's more! Next is Burning, which is more subdued than Sandstorm and doesn't really follow the same pattern. With a much slower buildup, it's less of an in-your-face dance track. He also throws in a bit of piano to ease us through before we hear shouts of "Feel the fire burning in my soul!" There isn't as much of a hook in Burning, but what we do get is slightly more calming, alongside some gritty tech honks to push us along. It's not his best effort, but it does provide a bit of range and shows that he won't settle on the Sandstorm sound alone. Feel The Beat, however, is basically a smoother Sandstorm, with a greater focus on more euphoric pads while still wedging in that cool bassline and the staple techy synth Darude's known for (though it's not as much in the limelight this time around). The breakdown right in the middle adds some sweet atmosphere as well. If you want some signature Darude without having it shoved straight into your eardrum, then Feel The Beat is the more suitable choice. Out Of Control is basically trying to imitate the previous songs, just with an overall softer feel; instead of chunky tech synths, we get happy beeping. The song lacks a particularly memorable hook, and it sounds like another member of the cheese parade, walking side by side with "Better Off Alone" by Alice Deejay. The single version has some lame vocals, and I was hoping maybe the album version wouldn't have these. Well, I sure was proven wrong, and I was sad. We get to chill out even more with Touch Me Feel Me, a much slower track than the rest, a bit of insight into the more relaxed side of Darude. If you're looking for a spacey, trancy excursion into another world without straightforward melodies or the need to pay attention to every detail and instead just soak it all in, this one will do you nicely. We don't always need high energy... But if that's what you like, Calm Before The Storm might give you that extra boost. Using yet unheard faux guitar plucks, Darude takes us back into club-friendly territory with pumping beats, a sharp bassline, and some ephemeral pads to keep us club-goers happy and healthy. But again, it won't be half as memorable as Sandstorm, even if equally interesting aurally. The next two tracks are ones that I always felt were lacking in a significant pull factor. After listening to them again, I'm still inclined to agree. Let The Music Take Control is a rather dry and unbeckoning track, focusing mostly on the ongoing thumps of the digital Hammond organ bassline, as well as the occasional use of the legendary train whistle, made überpopular in Playahitty's "1-2-3! (Train With Me)" from 1995. But that's all this track has. There's no real progression to anywhere interesting, and it's — dare I say it — filler. Same goes for Drums Of New York, which is basically six minutes of the same wavy bass effect over a standard jungle-style beat. I wish he had brought something else from New York, like more instruments or an actual melody. 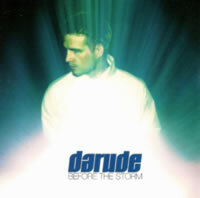 Darude is partially forgiven thanks to The Flow, which is actually a continuation of Drums Of New York, but it features a wider variety of dance elements, including hip-hop vocals and a crazy siren sound that is arguably the key grab of this track. It does get old fast, but at least he's trying to add SOMETHING. But it's sad to see an album with such dance potential go so far downhill and so quickly like it did after Calm Before The Storm. International versions of the album vary, but the bonus tracks at the end are Sandstorm (JS16 Remix) and Feel The Beat (JS16 Dark Remix). JS16, also known as Jaakko Salovaara, was Darude's production partner for this album, and so he's put his own personal touches on Darude's biggest hits at the time. The Sandstorm remix sounds suspiciously as though it wouldn't feel out of place in a modern Western movie soundtrack. It also doesn't focus extremely heavily on the "Sandstorm" infamous synth, in favour of adopting its own vibe. The Feel The Beat remix does the same, injecting the original with its own chuffy bassline and making it (indeed) "dark" with its own personality and rhythm. They're both less enjoyable than the originals, but it's nice to see another side of these classics. "Before The Storm" is an album that started out with great promise but lost most of its steam halfway through. That's a shame because Darude's later works prove that he IS capable of making some pretty gripping trance tunes if he puts his mind to it. But let's be honest: you're only interested in one song on this album, aren't you?